Above: Cammi Tse at 16 versus 17, sporting refined nose and slimmer face. It appears that Edison Chen’s (陳冠希) ex-girlfriend, Cammi Tse (謝芷蕙), has joined the new V-line party! The Hong Kong paparazzi recently uncovered some new selfcam photos of 17-year-old Cammi, in which she was spotted with a smaller and sharper chin. The tabloids reported that the angle of Cammi’s chin was even lesser than 90 degrees. With higher cheekbones, a thinner face, and large, round eyes, Cammi’s appearance resembled that of a manga girl. She is barely recognizable from her former self. Cammi is not the only star who is faced with plastic surgery allegations. Lan Kwai Fong 2 <喜愛夜蒲2> stars Mia (陳靜儀) and Shiga Lin (連詩雅), and Now 101’s new television host Icy Wong (黃婉曼) are also rumored to have gone under the knife. Like Cammi, they also appeared to have sharper V-line jaws. 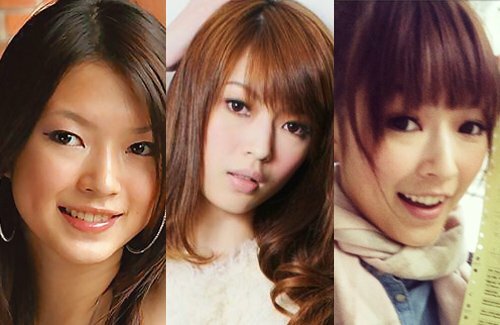 Above: Lan Kwai Fong 2 star, Shiga Lin’s changing looks reveal slimmer jawline, wider eyes, and higher nose bridge. Above: Lan Kwai Fong 2’s Mia sports slimmer face and refined eyes and nose over the years. Icy Wong first found critical success and fame through hosting TVB News’ Weather Report in 2009. Icy was never considered a beauty, but TVB News audiences were very impressed with Icy’s sweet looks, animating hosting style, and voluptuous body. According to Ming Pao, it is speculated that Icy had been making small cosmetic alterations on her appearance ever since winning the hosting gig for the Weather Report. By late 2012, Icy’s face had changed so much, many found her unrecognizable. Icy denied the plastic surgery allegations, insisting that her new V-line jaw is through a pepper mask that she had been consistently using since college. Above: Icy Wong’s pursuit of a slimmer face and sharp chin. Cammi Tse has done some work to her nose, refining the line, where her nose bridge before is not as clean. Her recent photos are beginning to resemble Angelababy. Shiga Lin is prettier with her rounder face, which showcased her dimple and warm smile better. Her current look lacks character and she’s barely recognizable! Maybe to her lips as well? Oh well, at least she doesn’t look like a horse anymore. I think Shiga got some botox as well – her face looks so unnatural when she smiles. She definitely got double eyelid surgery, and maybe chin implants? Mia already looks like she got something done in her first picture. Shiga Lin looked fine before. I don’t think she needed any PS. Meant to say “definately”. Gosh, I need the edit button!! I also like Shiga Lin’s older face. She looks like Theresa Teng in the first photo. Very sweet. The downfall of our civilization is imminent. I don’t see any difference in Cammi. Her newer picture just looks more photoshopped. Cammi’s nose bridge is cleaner and the tip more refined. Also cheeks look higher too (maybe due to derma filler). Overall, the enhancements are subtle, but they are there. I think Cammi Tse always looks good with makeup and not good without makeup. Not much change on face and probably isn’t a messy face. i dont see much difference either. everyone can get a high nose bridge, sharper jaw line with the perfect makeup, camera angle, and not to mention photoshop. Everything else maybe can be helped with makeup and photoshop but that V shape face + jawline on the new Cammi has morphed her whole appearence, she’s barely recognisable from her old self. Make up helps a lot sometimes. Bcuz if u ask 10gals, if it’s a all sponsored PS, 10 will definitely say YES! And given the chance to make urself beautiful, why not? Look at the below article. The Msia so-called AngelaBaby. She denied PS but she can’t erased all the pics she took in the past. Two years she took to change into such a WOW!! make up and angles the pic taken at does change the way some features appear. My face if I look straight into the camera or if I look upward becomes really round and fat, but if I lean my head to the side and tilt my head downward, my face ends up looking very slim and different. vast improvement on cammi’s part. even her hair looks shinier. i think it’s a shame her relatonship with edison got leaked because she could’ve properly debuted looking like this and no one would ever know. Cammi Tse “before” looks like Kate Tsui “before”. I guess they used different plastic surgeons. i do see the similarity now… kind of does look like kate. my god she thinks the public is as stupid as whose who believe Raymond Lam hasnt done a single thing to his face? Cammi did something with her nose.. much better now.. and liked someone said, starting to look like AB. What the heck is a pepper mask that can help make your face sharper? Can’t believe she will say that!